Bryans Pushers, Double Decker, Penny-Go-Round, etc. 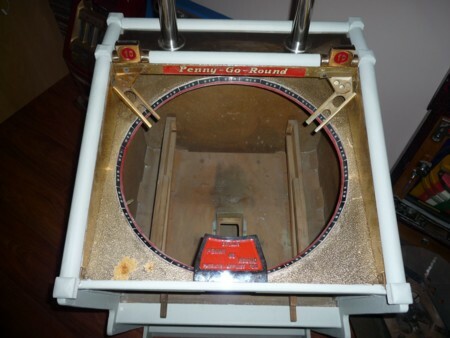 The Coin Pusher was introduced in the mid-60s, and gained instant popularity with the public. 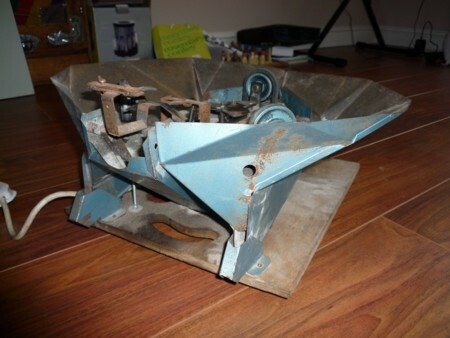 The lure of all those coins teetering precariously over the payout chute was irresistible. 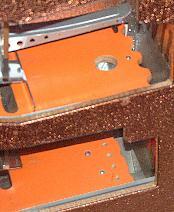 Many variations of Coin Pushers were produced by a number of manufacturers, including Bryans. 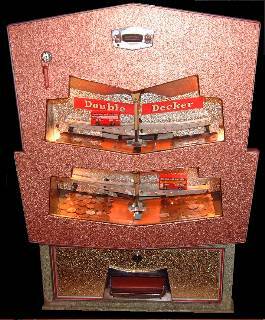 Bryan's best known contribution to the world of the Coin Pusher was the Double Decker. 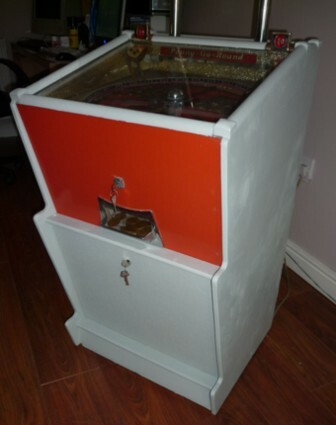 As was usual with Bryans machines, this gave the public something extra - this was a 2-level pusher, hence the name. Coins land in the centre of the top table and are swept onto the left or right tables, or into the gap in between (see close up below). 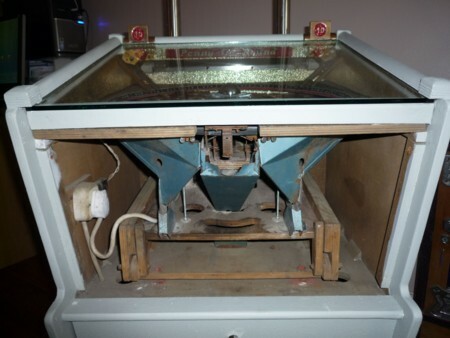 Coins falling through the gap fall onto the bottom tables where, again, they are swept left or right or into the central cash box. 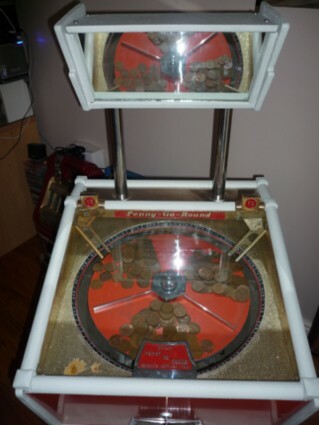 All coins pushed off the edges of any of the 4 tables are returned to the player. 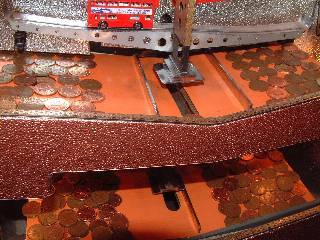 There are also holes in the top tables which allow coins to fall through to the bottom tables, causing coins to pile up in multiple layers. 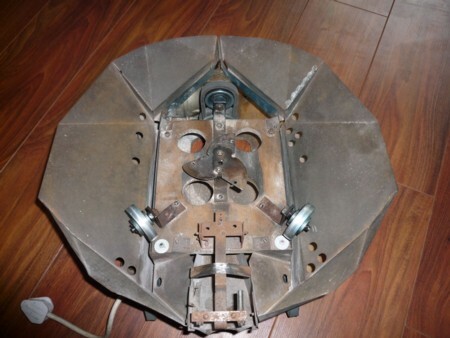 This results in greater wins from the bottom tables, but these are more difficult to achieve, as they depend upon two lucky pushes and more critical timing. The gameplay is well thought out. Coins dropping down the central chutes bounce randomly to the left or right, making the game more unpredictable. There is only one sweep on the bottom level, which sweeps both tables. 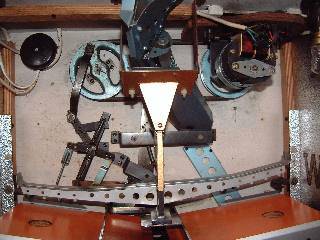 The horizontal link beneath the blue pulley is slotted and allows the sweep to be centralised. The top playfield and bus track can be seen at the bottom of the photo. 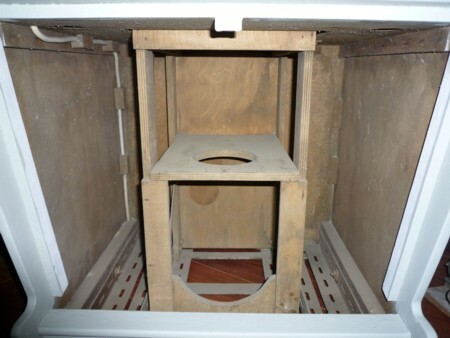 This early Double Decker has large semi-circular cut-outs on the edges of the top tables, and a number of small holes near the edges of the bottom tables. Quite what the point of these were, I don't know. Maybe they were experimental? Later Double Deckers had straight edges. The photograph is of a Double Decker on 1d play, so it is from 1968-1970. 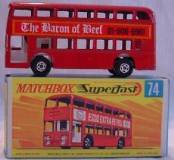 'Double Decker' Buses: The Double Decker uses buses from the Matchbox series. The buses supplied by Bryans were a No.5 London Bus in red for the top track and a No.74 Daimler Bus in green for the bottom track. 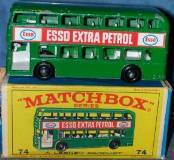 Many variations of these two buses have been produced over the years, in terms of colour, adverts, wheel type, etc. As far as I know, the London Bus was only produced in red, but the Daimler Bus was produced in red, green, cream, and possibly other colours. 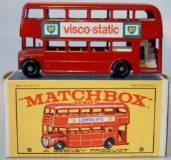 Other Matchbox buses will also work on the Double Decker - No.17 for instance. Models produced after 1969 have 'Superfast' wheels which run much better than the earlier wheels. 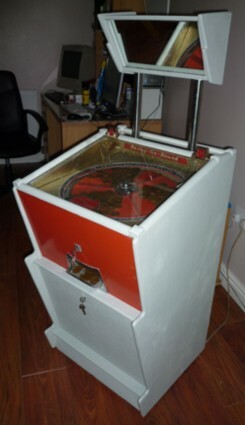 "The essential feature of this attractive machine is a slowly-revolving turntable onto which the player feeds his coins. Rotating in the same direction, but in an intermittent fashion, are three sweep arms in contact with the table. 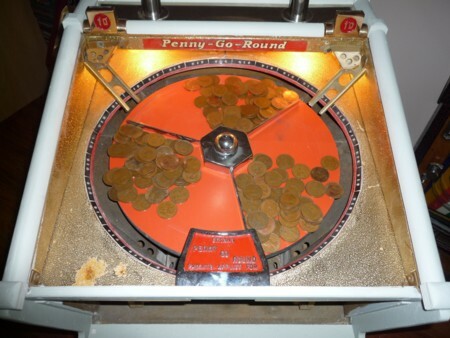 These radial arms sweep the coins into the shape of three sectors or triangles, thus providing the player with the fascinating spectacle of a mass of coins in constant movement." 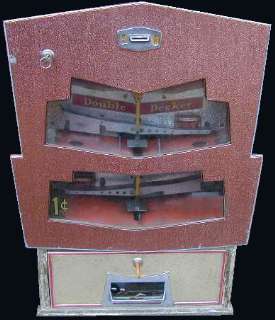 "Play: Two coin slots are provided, and the player attempts to drop his coin into one of the three 'swept' portions of the table, as it moves in line with the feeding chute. This requires a small amount of skill, and if successful, one or more coins on the edge of the chosen sector fall into the annular payout chute and are delivered to the player."